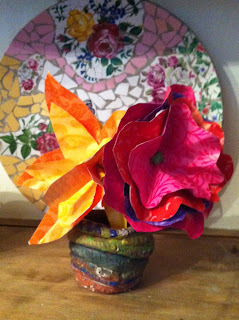 To make these quick and easy paper flowers all I used was different coloured sheets of paper and green pipe cleaners. First I cut a flower shape into 3 or 4 pieces of the paper each one in a different size. I didn't use a flower template I just cut out my flower shapes free hand. I then layered the different sized flower shapes together with the flowers getting smaller towards the centre. Then I pierced a hole in the centre of all the flowers and secured these all together by hooking the end of a pipe cleaner through the holes. To create a more flower like shape I folded and scrunched the paper inwards. If you want to use a simple flower template to draw around onto your paper before cutting around it there is one pictured below that you could print out and use.